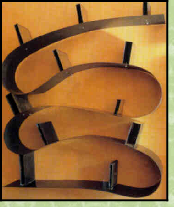 ...designs for interiors and furniture and his work has attracted international attention - notable is a distinctive style as in this design for a bookcase dating from 1992. It was made from one continuous piece of steel curving back on itself three times. Arad’s preoccupation with curves can be seen in chair legs, steps and roof trusses but all contribute to stunning designs. Many of Arad's designs start as one-off pieces and his studio - originally in Covent Garden and now in Chalk Farm, London, uses a variety of materials to achieve great originality. Concrete and sheet steel have been used in furniture and hi-fi sets. Visit the website for some interesting media clips - persevere in entering the site !